With that being said, I don't want to come across as a harsh person either - because that's not me. I say what's on my mind, even when I shouldn't. I don't have tact half the time and I don't have what the hubby would call nuance. However, those closest to me - my Ma and my hubby - will attest to the fact that I have a big heart and am very nonjudgmental at my core. This side of me is often not seen because I lack tact, so although I plan to be unapologetically me, hopefully Lattes with Grace will show both sides of me. These pictures encapsulate the multiple aspects of my personality, which can often be misunderstood. How are you unapologetically you? Do you ever feel misunderstood? 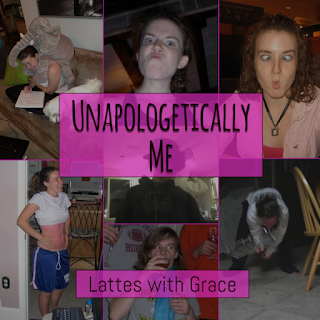 Check back here for more on me being unapologetically me.